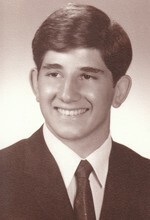 After graduation from HS, I attended Syracuse University. After that, I attempted three times to get into medical school. On my third attempt, and after six years of graduate school, I succeeded. I graduated from Albany Medical College in 1983. During the next four years, I served in the Air Force as a physician, completing two years of a four year residency in OB/GYN in California, and then as a Flight Surgeon. The flight surgeon position brought Beverly and me to the South (Valdosta, GA), and we have lived in the South ever since. Beverly (Baum), also in the Class of '69 (Williamsville South), and I got married in 1973, and we have two kids and two grand children. Anyway, after getting out of the Air Force in 1987, I became an Emergency Medicine Physician, and have done that ever since. As I look back on my HS days, I think about the extracurricular stuff, like sports, but mostly performing in A Man For All Seasons. I am a fairly religious person, and Beverly and I are both Catholics. Sir Thomas More was truly a wonderful Saint, and I feel so honored to have been able to portray him in that school production. In a way, that role changed my life, or at least has served as an "anchor" of sorts for me. Sir Thomas More is about the best role model I can imagine, in terms of leading a life of integrity. I am not a saint, but he was, and he inspires me to do better in my Christian walk. 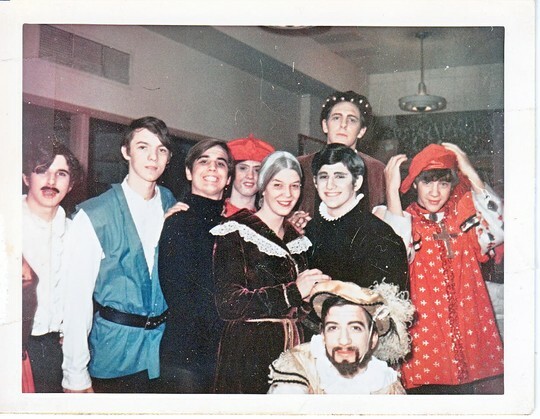 That whole cast and production is my fondest memory of HS. And I would love to meet up with our director, Mr. Schihl (taught math) sometime to personally thank him for that production, and how much it has meant to me during my life. ADDENDUM: Thanks to one of the organizers of this webpage, Beth Anne (Betzer) Kafasis, Dr. Schihl was found and made aware of my wish to contact him. We have had a great "reunion" through e-mail and over the phone. He wants me to tell everyone that he has very fond memories of our class and his time at South, in his words, "Some of the best memories of my career." He went on to get married, complete a Ph.D., start a University, become the Dean of a University Department, teach philosophy at the graduate school level, and is now 100% dedicated to education in the field of Catholic teachings - doctrine, dogma, tradition, history of the Church, etc. He has an awesome website called catholicapologetics.org. (be sure to type in ".org" at the end). Again, he wishes all of us his best and said he would be happy to be back in touch with anyone who wishes (rjschihl@gmail.com). Thanks again to Beth Anne for helping me "get my wish" and rekindling my friendship with Dr. Robert Schihl! I remember a bunch of us guys would get dressed up as "dirty old men" and drink beer at "the shack." It was pretty bizarre. We would sing songs like "Shine on, Shine on Harvest Moon..." I also remember hanging out all the time with my best HS buddies, Bob Weber (moved away in Junionr year), Jeff Hayden, and Irwin (Sonny) Liss. We were all a little crazy, but had a lot of fun. Also, for a time, Dennis Dean, Dennis Newkirk, Jeff Hayden, Tom Cotton (different class) and I were in a band (The Fifth Generation). I was lead singer, but really couldn't sing. We never got a single job when I was in the band. After I got kicked out (for lack of musical talent, as was fitting), the band enjoyed some success, with Dennis taking over lead vocals and still playing the bass guitar. Dennis was always the heart and sole of the band. I remember being in sports (wrestling, baseball, swimming, and football). It was an honor just to make the team and stick out the seasons. I remember always being in awe at how talented some of the guys were, especially Tim Burns and Mark Lesniowski ("Lester"). It was a great time to be in HS. Thanks to everyone for being in my life back then. I hope to see many of you at the reunion. Bruce Sabatino has a birthday today. Bruce Sabatino posted a message. 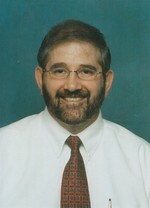 Bruce Sabatino in 2004. Still had a little hair. Note: about 6 months ago, my wife Beverly and ALL of my nurses told me: Look, you are bald, OK? It's time to stop doing the "comb-over" thing. Shave the top of your head. So I did, and I am adjusting to this obvious sign of aging pretty well. It's hard to get old. But one thing I am absolutely certain of. Everyone in the class of 1969 is "in the same boat." 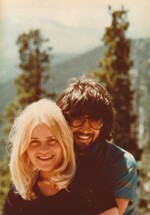 Bruce and Beverly Sabatino, 1976. On a trip to Colorado. We had been married 3 years. If you check out Beverly (Baum) Sabatino's profile, you can see how we look now. She has photo of our family taken this past Easter, April 2009. Our two children, Brian (born 7/79) and Bethany (born 2/82). This photo taken in 2002, during a weekend in the mountains of North Georgia. Bethany is now a veterinarian, still single, and about to start a residency (small animal internal medicine and surgery) in Knoxville, TN. Brian is a mechanical engineer, married and has two kids of his own. Bruce Sabatino (center) with our now deceased classmate, Dr. Lance VanDusen (on left). Lance and I both went to graduate school in the 70's in Buffalo (Roswell Park Cancer Institute, Seventh Division of the SUNY at Buffalo). Lance got his MS in natural sciences, as did I. I also went on to complete my Ph.D. in Experimental Pathology, but it took years for me to finish!! Lance and I are here together, along with another mutual friend from my graduate school days, Tom Stewart. This photograph was taken on the occasion of my Ph.D. graduation party in 1993. Lance was a Dentist practicing in Lewiston, NY. He died in the prime of his life of a massive heart attack in 2003. Lance was a great guy. This is another sad example of how fragile life is, something we can all relate to on this occasion as we think back on our deceased class mates.